Lobby cards and fliers promoting mostly silent westerns, 1910s-1920s. 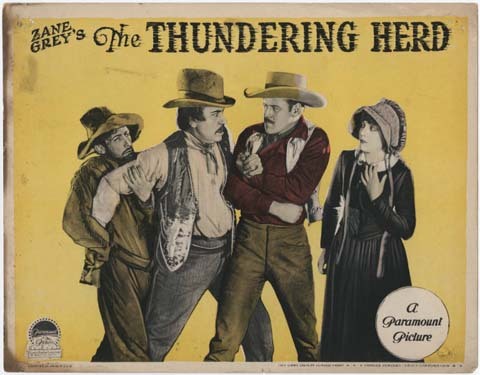 The Western Silent Films Lobby Cards Collection consists of 106 printed items used to promote silent and western films; most of the materials in the collection date between 1910 and 1930. These lobby cards and publicity fliers include both photographic and artistic renderings of scenes and characters from the films being publicized, and often prominently display the names of actors and film studios. Lobby cards were introduced in the 1910s to complement movie posters and were designed for display in the lobbies or foyers of movie theaters. These eponymous artifacts were intended to lure pedestrians into the theater by advertising dramatic, key scenes from the movie or highlighting popular actors. The collection consists of 105 items (86 lobby cards and 19 printed fliers) promoting sixty-eight films.